Make your own mulled wine, cider or apple juice with these spice bags. 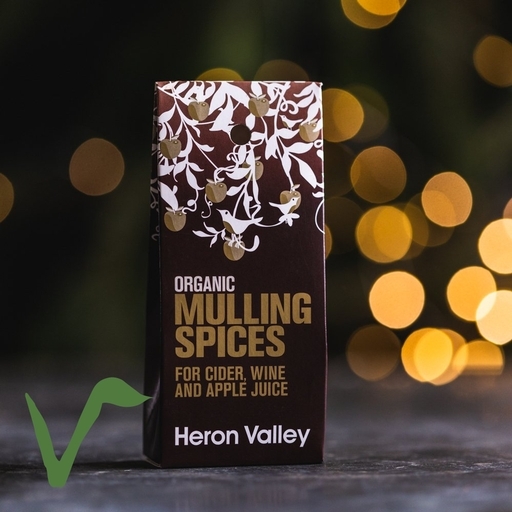 Heron Valley’s blend mixes organic cinnamon, ginger and nutmeg, for a festive drink to warm the cockles. Gently warm your wine, cider or juice in a pan and pop in a spice bag to steep. Add sliced lemons and oranges, a sprinkle of sugar, and a splash of brandy for even more festive punch. Heron Valley’s winter party drink recipe: Take 2 litres of still cider, warm in a large pan with 2 mulling spice bags, sugar to taste (approx. 2 large cups) and half a lemon. Infuse for 10 mins. Or, warm 2 bottles of sweet apple juice in a large pan with 2 spice bags. Add a shot of rum or Pimm’s and infuse for 10 mins. Heron Valley is a family business from deepest Devon. They’ve been making award-winning organic juices and cider for 20 years. They believe in putting only the best whole organic fruit in their drinks and pressing and bottling by hand. These mulling spices are just the thing to transform their beautiful juices into a warming festive party drink. cinnamon (50%), ginger (40%), nutmeg (6%), cloves (4%).